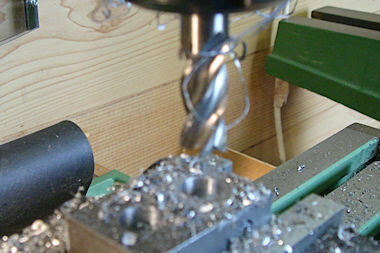 The vice that I have been using on the WM14 mill is in fact a drill vice and suffers from a small degree of jaw lift when it is tightened up. It is quite useable providing the part being held is a reasonable size and locates well against the fixed jaw. 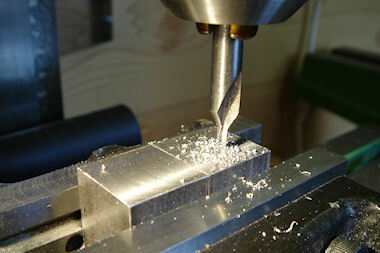 I decided to treat myself to one of the many small milling vices available, made of course in China or thereabouts. 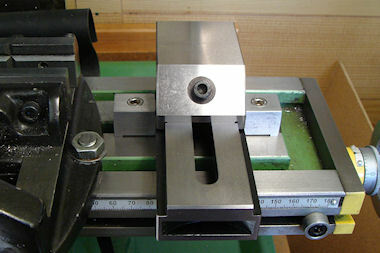 I′m not sure if it is technically a milling vice, I don′t think it is really sturdy enough to be classed as such. I have seen similar vices described as toolmakers vices or as "screwless" vices, although they do of course have a screw! The advantage they have over a drill vice is that as you tighten them the screw both closes the jaw and pulls it down onto the vice base. I only wanted one of the smaller versions (1) and opted for a 50mm Precision Tool Vice from Arc Euro Trade. In operation the angled locking screw eliminates jaw lift by pulling on a T-bar (2) which is engaged in a rack machined into the body of the vice. The rack in turn allows the movable jaw to be re-positioned whilst keeping the locking screw at an optimum angle. The base of the vice has a slot at either end for clamping to the mill table which is fine if you need the vice aligned along the table. 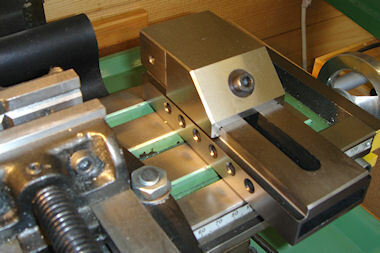 If you need to align the vice across the table some other clamping arrangement is necessary. I have detailed below how I made a pair of clamps to achieve this. As can be seen with the vice on the mill table (3) the only way to clamp it down is to make use of the line of holes on either side of the vice base. First thing to do was to measure the height of the hole centre from the table (4). I found a piece of round stock that fitted the holes nicely, the rod measured 5.94mm which I assume is nominally 6mm, I placed the bar in the hole and with another bit clamped under the vice could measure and calculate the centre height of the holes. 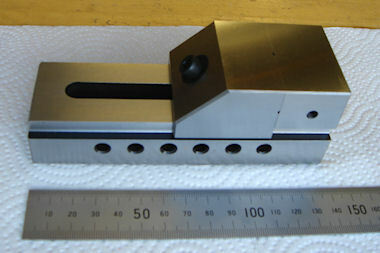 This turned out to be 12.7mm (½"), a bit odd as the vice measurements are all given in mm and the holes are 6mm, I wish someone would decide whether we are metric or imperial! Once the centre height was established I worked out some sizes based on the materials I had to hand. I used mild steel for everything, a free-cutting variety would be good but the bits I used were not machine friendly. I sketched out a drawing and have tidied this up a bit, click on the drawing above (5) for a readable version. If you make these clamps check your vice first, the only critical dimension is the height from the mill table. I found some 19mm square bar, I think it is actually ¾" but it was just the right height. I cut off (6) two sections at 25mm with a small allowance for cleaning up. 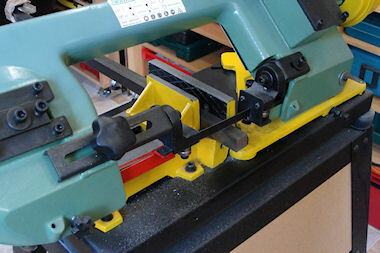 The bandsaw is Warco′s smallest saw, I put some castors on the stand and it can be tucked away in a corner when not in use. I de-burred the two blanks and cleaned up the cut faces on the mill (7). 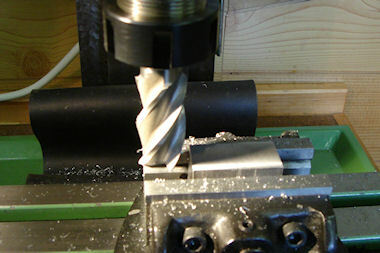 I don′t have a facing cutter so I just used a large endmill. I didn′t take any particular care to get these square just relying on the bandsaw cut to be reasonably good and rested the cut end on a small piece of bar to set the surface to be cut at a reasonable height above the vice jaws. As the blanks were already set in the vice I decided to drill the two holes for the pins. This as it happens was a bad move and if I were to do it again I would remove the blanks from the vice and drill and counterbore the hole for the screws before the holes for the pins. However my next move was to use an edge finder to position the holes for the pins (8), sorry about the fuzzy photo the camera auto-focus seems to like the background! Having worked out where the centre of the pin should be I used a centre drill (9) followed by a 5.5mm drill to a depth of 11mm. I then opened this up to suit the pin diameter (10). I was going to Loctite the pins in but as it happens the hole I ended up with was close enough for a push fit. I was going to drill 6mm but with the pin diameter only 5.94mm I thought this might be too loose for Loctite especially as the drilled hole would likely be oversize. The nearest drill I had to the rod diameter was 15/64" which is 5.95mm, I thought this would give a reasonable fit but it drilled slightly undersize and voila a push fit! 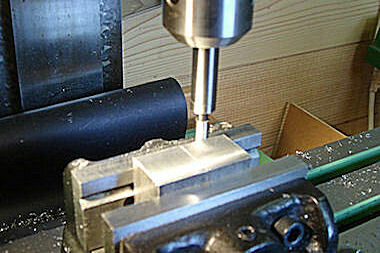 I next drilled and counterbored the holes to take 6mm allen head cap screws (11). Having reset the two blocks in the mill vice topside up I used the same procedure to drill the 6mm holes viz: use the edge finder, centre drill and then 6mm drill through. It was this last bit, the drilling through, where things went wrong. 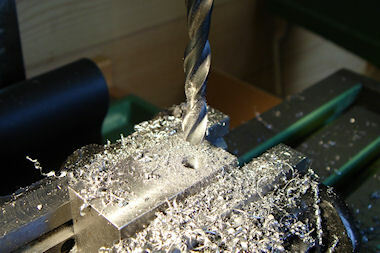 As the 6mm drill encountered the hole for the pin it was deflected off course, enough I later found to stop the cap-screw dropping into the counterbore. 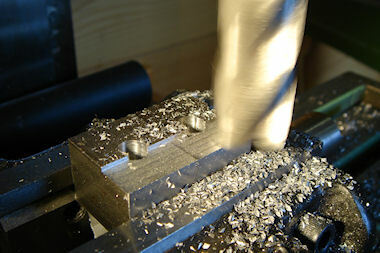 I used a 10mm endmill to cut the counterbore directly after drilling so as to retain the centre. Once I had cut the counterbore I tried the cap-screw to check that the counterbore was deep enough, this is where I found it wouldn′t go in, I had to use a 6mm endmill to re-align the drilled hole. Fortunately I hadn′t moved the mill table so the centre setting was still good and the mill was much stiffer than the drill and re-cut the hole on the correct line. Lesson learnt, don′t try and drill through half a hole! 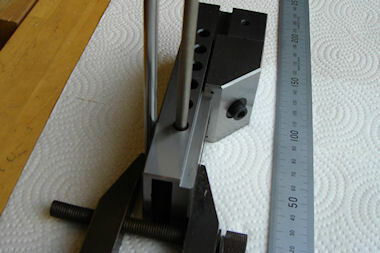 You may have noticed on the drawing that I havn′t put a measurement for the depth of the pin hole. There are three possibilities here:- either drill the pinhole much deeper and fix a longer pin in the hole and then drill through the pin; drill the hole for the pin after the bolt hole put the cap-screw in the hole and push the pin up to touch it (this is what I did); or drill the hole for the pin 7mm deep and push / Loctite it in. You could of course turn the pins directly onto a longer length of square bar! Once I had sorted out the foul-up with the holes I turned the blocks over and milled the 1mm step into the underside (12). This basically creates built in packing and allows the clamp to pivot slightly when tightened up transferring clamping pressure onto the pin. This is all the work required for the blocks and they can be removed from the mill vice and de-burred. 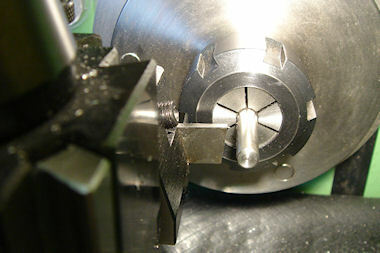 The two pins are straightforward turning, I put a length of round bar in the collet chuck, faced, chamfered and parted off to length (13) for the two pins. 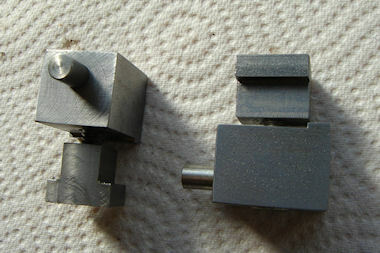 I made these 17mm long and reversed them in the chuck to put a small chamfer on the parted off ends. 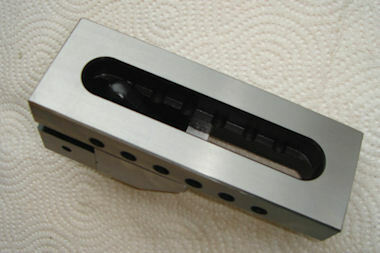 I then pressed the pins into the block using one of the 6mm cap-screws as a stop to prevent the pins going in too far. 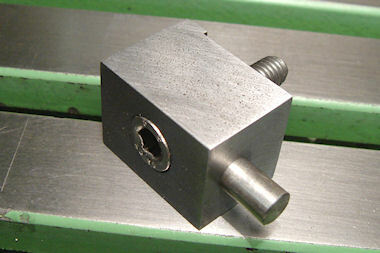 The finished items can be seen (14) with the cap-screws in place fitted to a pair of tee-nuts. Two final images of the completed job. (15) shows the vice clamped to the mill table and they seem to be quite effective, at least I cant move the vice once the cap-screws are pinched up. (16) is a close-up of one of the clamps on the mill table, this shows that I haven′t bothered too much about the finish, after all they are supposed to do a job not look pretty.